If you’ve been following our announcements in the last few weeks, you know we’ve been committed to bringing you features that you’ve been missing from the old AdSense interface. We’re now launching another long-requested feature: ad styles. 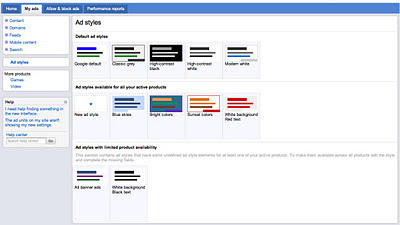 Ad styles extend and enhance all of the functionality of our old color palettes. With ad styles, you can create customized combinations of colors, fonts, and corner styles and then easily apply these to the ad units and search engines across your site. The best part about ad styles is that when you edit an ad style in the new interface, any ad units or search engines that are using this style will automatically be updated with your changes. So if you want to test a new color for the ad units on your site to see how it performs, you can create a new ad style and apply it to some of your ad units. If it performs well you can then apply it to all of the ad units in your account or revert back to your old colors just as easily. 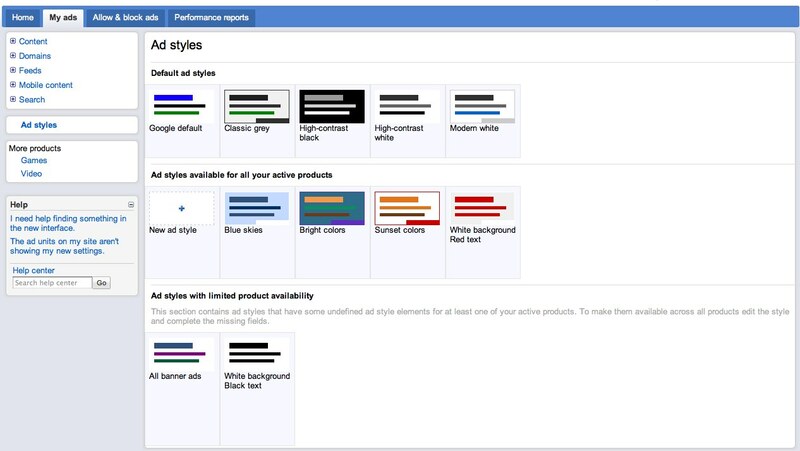 We think this feature will save you time by eliminating the need to re-assign the colors to each ad unit individually. To create a new ad style, visit the ‘My ads’ tab. Click ‘Ad styles’ in the navigation bar and then the ‘+New’ button. You can then assign existing ad styles to your ad units during the ad unit creation process.